Bitcoin Press Release: IPSX, the first blockchain-powered IP Address Sharing platform, is set on a road to success, making fast progress and establishing itself as one of the most promising tokens in the altcoin ecosystem. April 17th 2018. Hergiswil NW, Switzerland: After the successful results in the Token Generation Event on the 5th of March, which ended with approximately $8 million raised, the company is taking the next steps in making IPSX Token available and accessible to cryptocurrency investors and traders worldwide. The company also launched the demo version of the platform (MVP) for sharing IP addresses, available here if you want to test it. The IPSX Token was recently listed and is now available on Qryptos Exchange, Quoine’s fully digital cryptocurrency exchange and trading platform. Shortly following the IPSX Token listing on Qryptos, the company announced the listing on Bibox. Bibox is one of the leading AI Enhanced Encrypted Digital Asset Exchange, with an average trading volume of $65 Million. With offices in the US, Japan, Korea, and Estonia, Bibox is one of the most important cryptocurrency exchange on the Asian Market and is currently one of the top 30 exchanges worldwide, as ranked on coinmarketcap.com. What’s more, the startup has already secured a few important partnership and more will follow. Recently IPSX officially announces its partnership with Data Center Luxembourg, one of the main colocation, cloud and connectivity services provider in the world. Among other functionalities, IPSX allows Data Centers to share a full range of unused IPs. This will enable, Data Center Luxembourg or any other Data Centers to share a full range of unused IPs, in a highly secured environment, in order to generate revenue and become more cost-efficient. Soon after the partnership with Data Center Luxembourg, the company announced its partnership with Atonomi, one of the most highly regarded blockchain projects in the IoT field. 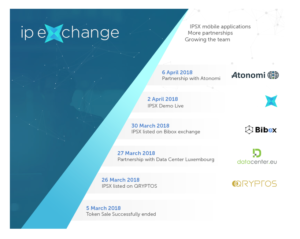 Atonomi’s core vision aligns perfectly with IPSX, as IoT is one of the major fields where IPSX can innovate by developing new use cases. George Bunea, CEO & Co-founder of IPSX. The company also stated what are the actual objectives that they will pursue in the following period. An entire team of developers is working on the IPSX mobile applications, which will soon be launched. Developing more business partnerships is also an important part of the company strategy at the moment. IPSX is looking to get in touch with companies from all industries willing to integrate IPSX capabilities with their businesses and start a mutually beneficial strategic partnership. and talented spirits to join them on the amazing IPSX journey. After the successful TGE, IPSX team will now focus on developing and perfecting the IP address Sharing platform as an important part of the next phase of the 3.0 web, as a distributed network layer. IPSX is a one of a kind project: a fully-decentralized IP Sharing platform, founded on blockchain capabilities. Its main objective is to meet the high market need for IP addresses for both users and organizations. Through its capabilities, IPSX aims to unlock countless opportunities for businesses in different industries. The platform will create a secure IP Address sharing marketplace, fully transparent and decentralized, an ecosystem that will allow entrepreneurs and developers to use IPSX embedded tools (SDKs and APIs) in order to develop custom applications that require a large number of IP Addresses. These capabilities will enable IPSX to stand at the core of the next phase of the web. Silviu Istrate is the source of this content. Virtual currency is not legal tender, is not backed by the government, and accounts and value balances are not subject to consumer protections. Cryptocurrencies and tokens are extremely volatile. There is no guarantee of a stable value, or of any value at all. Token sales are only suitable for individuals with a high risk tolerance. Only participate in a token event with what you can afford to lose. This press release is for informational purposes only. The post IPSX Moving Forward at a Fast Pace: the IPSX Token is Already Tradable on Qryptos and Bibox, Launches Demo and Announces Big Partnerships appeared first on Bitcoin PR Buzz.